The shooting setup was a basic seamless white stage, on which I animated the Doughboy puppet and a few kitchen props. Replacement heads were used for facial expressions, which was difficult as this required his hat to be removed and carefully re-aligned with every head change. For the iconic finger poke I used a prop hand, and strove for a more exaggerated reaction than what the Doughboy typically does. In post production a real hand was composited over the prop one, as well as some holiday graphic elements to spice things up. Although most commercials are broadcast for a very short time, this one was shown for many years. Pillsbury even repurposed my animation into a Halloween cookie commercial. In the name of progress, the Doughboy has been computer generated ever since then. While CGI may look technically superior, I contend that the traditional stop-motion technique presents a more charming and realistic Doughboy to the audience. Examples from the Halloween alternate version. 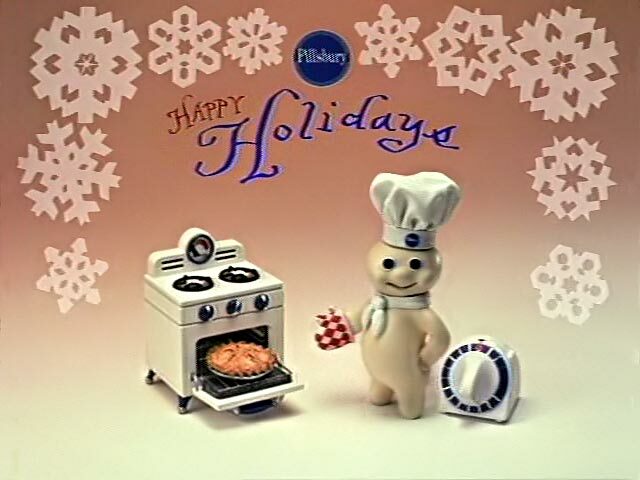 The Doughboy is trademarked and copyrighted by Pillsbury.